You can quickly and easily customize the look of your SharePoint site to reflect your professional style and brand. The options available to you depend on the version of SharePoint you're using. Note: To change the look, you need site owner or design permissions on the site. 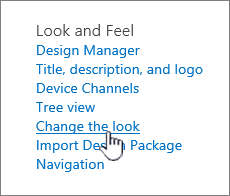 Change the look settings are located under Settings in the top right corner of your SharePoint site. For team sites, you can change the theme and header. On communication sites, you can also change the layout of your navigation and add a footer to your site. You can choose one of the default SharePoint themes and customize it as needed, choose a company theme with approved branding for your company, or use one of the classic experience designs. 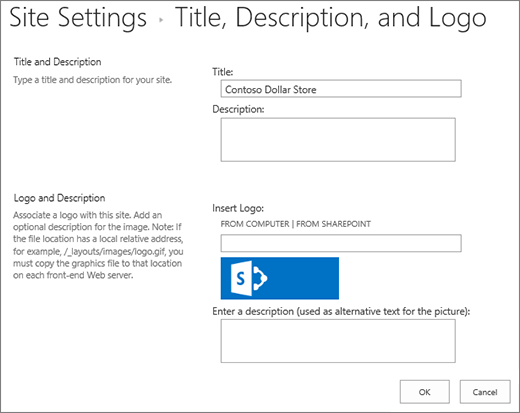 To create and upload a company theme, see SharePoint site theming. 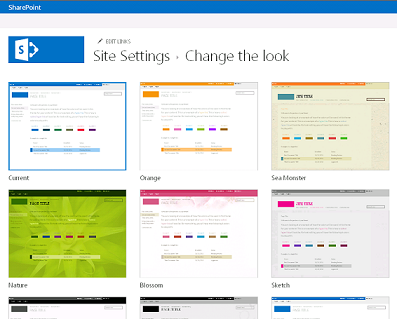 For additional ways to customize your site, see Customize your SharePoint site. On your site, click Settings and then click Change the look > Theme. Note: If you don’t see Change the look on the Settings menu, you may not have permission to manage this option. For more information, see Understanding permission levels in SharePoint or ask your administrator. Select the look you want. You'll see a preview of what your site looks like with the selected theme applied. Click Save to apply it to your site or, if you don't like what you see and want to revert back to what you had in the beginning, click Cancel instead. Your administrator may have set site theming to show only a list of company-approved themes. If so, you won't see any of the default SharePoint themes. If you're updating the theme on a subsite or your administrator has sites set to the classic experience, follow the instructions in the Classic experience designs section . 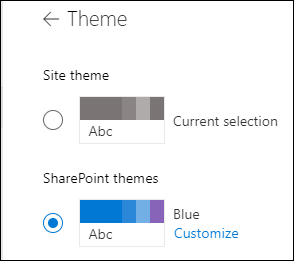 To customize the colors of one of the default SharePoint themes, select the theme and then click Customize. Choose the main color and accent color you want, and then click Save to apply it to your site. The list of main colors and accent colors varies depending on the default SharePoint theme you choose to customize. Note: Currently, you can't change the background color for your site using this setting. SharePoint administrators can make changes to company-approved themes as described in SharePoint theming. On your site, click Settings and then click Change the look > Header. Select either the Standard header layout or the Compact option which moves all header content to a single line. Click Change to add a site logo. Select a header background to change the background color of your site header. On your site, click Settings and then click Change the look > Navigation. The megamenu style is only available on SharePoint hub sites associated with Microsoft Teams or on communication sites. 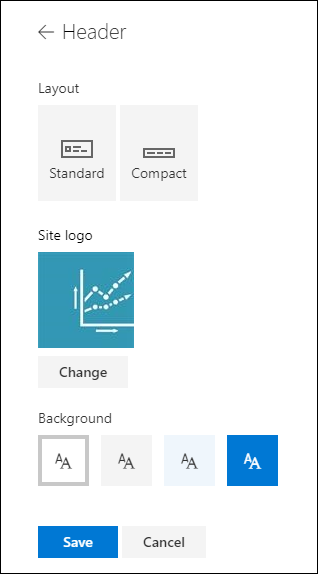 To change your navigation links, see Customize the navigation on your SharePoint site. Links added to the 3rd level when using the megamenu style will display as a single vertical list only. On your site, click Settings and then click Change the look > Footer. Toggle the switch to On to add a footer to your site. Click Upload to add your logo image to the footer. The image is automatically resized. To add a name for your footer, toggle the switch to On and enter the name. To add or change links in the footer, click Edit footer navigation links. You can add one level of up to eight links or labels. 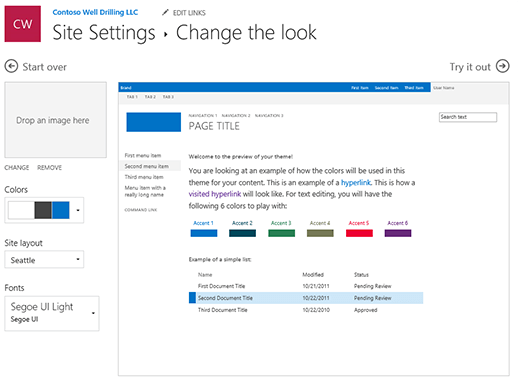 For more information about adding or editing navigation links, see Customize the navigation on your SharePoint site. Note: The site footer feature is only available on communication site site pages. They are not available for list pages, library pages, or other pages on your site. On your site, click Settings and then click Change the look. Click View classic settings or Classic change the look options. If you're already in the classic experience, skip this step. Choose a look from among the choices. Don’t worry if you don’t like the color or the image exactly, you can change that in the next step. 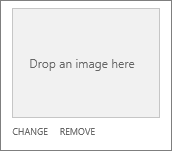 To add or change the background image, click Change to upload an image of your own, or drag an image from your computer onto the thumbnail image above the Change command. To change the color scheme, click the arrow next to Colors and select another color scheme. To change the layout, click the arrow next to Site layout and select another layout, which controls the position of the navigation links, search box, and so on. To change the fonts, click the arrow next to Fonts and select another font. Note: You can change the font type style, but you can't change the size. When you’re ready to see a full-sized preview of how your changes look when applied to your site content, click Try it out. The changes are not yet visible to other site users. Note: If you don't like what you see and want to revert back to what you had in the beginning, click Start over or you can click your site logo to exit Change the look and go back to the home page of your site. If you like what you see in the preview, click Yes, keep it. If not, click No, not quite there and try something else. Choose the main color and accent color you want, and then click Save to apply it to your site. You can also select whether or not a grey (Neutral), light (Soft) or dark (Strong) version of the main color is applied to the header of your site or you can keep the default white header background. 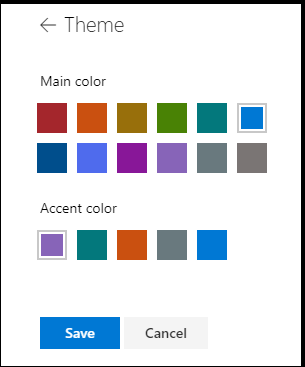 The list of main colors and accent colors varies depending on the default SharePoint theme you choose to customize. On your site, click Settings , and click Change the look. You can also click Settings , click Site settings and then under the Look and Feel heading, click Change the look. If the Get started with your site tiles are on your home page, you can click the What’s your style? tile. If you don’t see Change the look on the Settings menu or on the Site Settings page, you may not have permission to manage this option. For more information, see Understanding permission levels in SharePoint or ask your administrator. Choose another look from among the choices. Don’t worry if you don’t like the color or the image exactly, you can change that in the next step. To add or change the background image, click Change and upload an image of your own, or drag an image from your computer onto the thumbnail image above the Change command. Note: If drag and drop is not working, install the latest version of your browser software or at least Microsoft Office 2013. You can instantly see what changes look like in the preview area. To revert back to what you had in the beginning, click Start over. You can also click your site logo to exit Change the look and go back to the home page of your site. Since SharePoint installations may have different versions, or can be customized any number of ways, the designer of your site might have provided a different way to exit. Ask your administrator if you don't see one. To see a full-sized preview of how your changes look when applied to your site content, click Try it out. The changes are not yet visible to other site users. If you don't like what you see so far, click Start over. Note: Once you're done, or you change your mind, click the one of the breadcrumb navigation links in the upper left of the screen to get back to where you were. The title is often the first thing your site visitors look at when they visit your site so it’s a good idea to choose a title that describes your team or project. Adding a logo can help people quickly see that they’re on the right site. On your SharePoint site, click Settings and then click Site Settings. On the Site Settings page, under Look and Feel, click Title, description, and logo. Note: If you don’t see Title, description, and logo, you may not have permission to manage that option. You need to have at Owner or Design permissions for your site. Organization can also define the design for an entire site collection and has removed your permission to manage these options. For more information, see Understanding permission levels in SharePoint. Enter a new title in the Title field. The new title appears on each page of the site. Enter a new description in the Description field. The description doesn’t appear on the site but does show up on your search results pages. To upload your logo from your computer, click From Computer, click Browse, locate the image and click Open. If you don’t like how the logo appears on your site, just modify the logo and repeat the steps above to overwrite the logo.